EcoCamp Patagonia in Torres del Paine National Park, Chile. The world’s first geodesic hotel in the remote wilderness of Chile, that’d be glam, right? Liz Schaffer finds out. I believe the best Chilean holidays should leave you wide-eyed and dust covered. 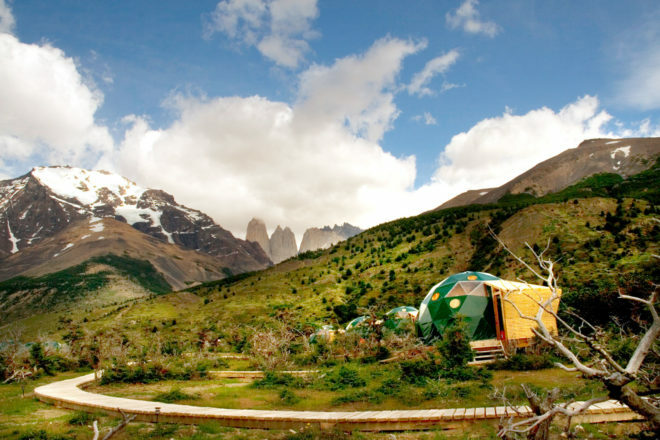 Nestled in the Patagonian wilderness at the foot of Torres del Paine’s iconic granite towers lies EcoCamp Patagonia, which prides itself on its sustainable design and unconventional approach to glamping. There is no internet, mobile phone reception nor TV. Punta Arenas, at the southern tip of South America, is 370 kilometres away and at night the main source of light is the moon. As a fan of remoteness, this was blissful. The layout is simple. 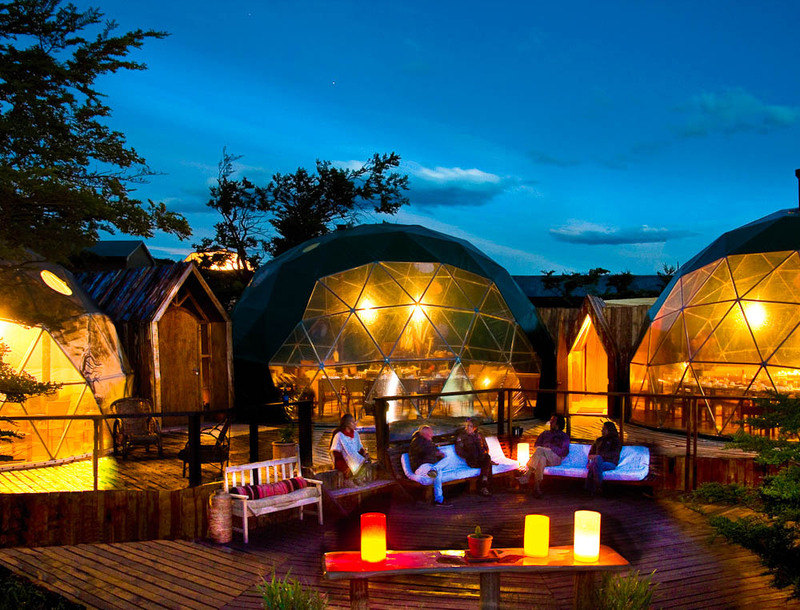 Raised wooden walkways link the three ‘community domes’ (home to the bar and dining room), communal bathroom and various green accommodation domes, all of which overlook the ancient Patagonian plains. Wildflowers and roving condors add character while solar panels and a micro-hydro turbine provide the energy. As the world’s first geodesic hotel, most of the accommodation domes are designed to only house two guests, so our family was split between the standard and superior domes. As the name would imply the latter was definitely the more luxurious option. Built in the same shape as the ancient Kawesqar tribe dwellings, this suite rocks rustic wooden interiors, a wood stove and open terrace. Fleecy bedding aside, the real selling point was the ceiling skylights that let you fall asleep watching the spectacular light show put on by the various constellations of the Southern Hemisphere. Naturally, having a private bathroom is an added advantage. The standard domes feel a little like hobbit holes (it took me four days to remember just how low I had to stoop to avoid my doorframe), but soon become home. Considerably larger, the community domes are the heart of the camp; a place to charge laptops and cameras (there’s no power in the standard domes), hear about upcoming activities and pour over the assorted maps and guide books. It’s the sort of space that makes liveliness, work and conversation flow. Evenings feel like a slightly chaotic dinner party, complete with home-style food and service. The Patagonian fusion cuisine mixes the familiar with purple potatoes, quinoa and patasca from the Altiplano. Dishes arrive at the table when they’re ready, so guests pass the time sampling the numerous bottles of local wine decorating the tables. To be honest though, the vibrant, spice-filled fare was wasted on me. After a day out in Torres del Paine I was happy to eat anything. Led by enthusiastic, young guides I had encountered the national park’s wild plains, glacial lakes, roaring waterfalls and treks over every imaginable terrain. The Paine Massif, which reaches a height of 2883 metres and is part of the Andes chain, is a particularly humbling feature. Thankfully the guides’ youth works in their favour; they were as fascinated by the surrounds as me and always up for a mid-walk chat. They can also prepare a lethal Pisco Sour come cocktail hour. The company and location all made me feel quite adventurous. So while discussing activity options post-dinner I’d regularly choose a 22-kilometre portion of the aptly named Paine Circuit over the bike ride and barbecue on the Patagonian flats. It’s all too easy to be tempted by the stunning backdrop and inevitable sense of achievement. While some of Torres del Paine’s iconic attractions lie further afield (Glacier Grey is a good two hour’s drive from the camp and several walks can only be reached by boat), you can simply step out of your dome and begin a hike. My clan discovered this when breaking from EcoCamp’s cyclical Wildlife Safari program. After voicing our desire to go solo for a day we were presented with a map and willing guide who led us on a private walk along a glacial river. While they don’t advertise this fact, all you need to do here is speak up. Let staff know exactly what you want on the activity front and they’ll do their best to deliver. This eagerness, more than anything, made me dread my return to the modern world. Turns out early morning hikes, communal living and the thrill of the outdoors are rather difficult to bid farewell. Liz Schaffer paid $346 per night and booked directly. was conducting a llittle research on this. But yeah, thanks foor spending time to talk about tyis topic here onn your website.